fter a nine-hour flight from Chicago to Budapest and a drive of nearly 130 miles from Budapest to Heviz to meet up with my Swiss friends, we finally reached our destination. The town of Heviz is located on the southwestern tip of Lake Balaton and is known for its thermal lake. 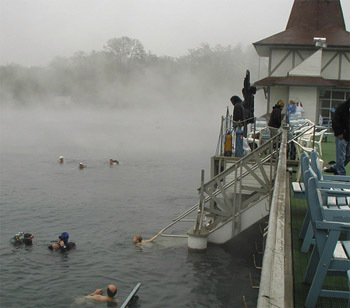 Visitors from all over Europe come to swim and bathe in Lake Heviz, because the content of sulfur and other natural elements make a great source for healing arthritis and other physical ailments. Lake Heviz is 47,500 square meters and its estimated to be about 22,000 years old. The water that erupts into the cave is also old. 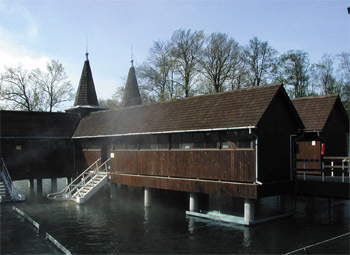 The thermal water is believed to be about 10,000 years old, where as the cold water is only 8,000 years old. The water emerges from a depth of about 1,000 to 2,500m / 1500 / 8000 feet. Every 83 hours the lake replenishes itself. The lakes temperature never drops below 23ºC/74ºF in the coldest of winters. In the summer months, the water temperature is usually between 27ºC/80ºF and 29ºC/84ºF. 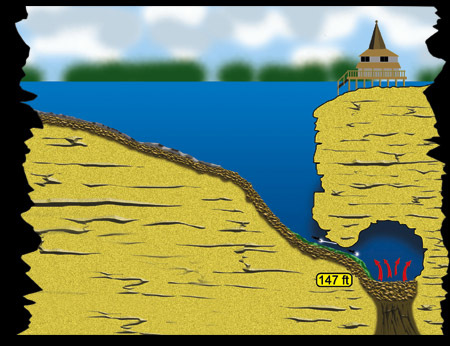 The average depth of the lake is 2 to 5 meters. The lake bottom is covered with a thick layer of very fine silt. Almost in the middle of the lake is an asymmetrical crater, with a wall running east and west, reaching depths of 38m/124ft. Average visibility in the lake is around 3 to 5 meters all year. Between 1986 and 1990 there were numerous underwater construction developments in Lake Heviz. First, a multi-person deco chamber was built for the safety of the deep construction workers. The work included removal of 80 cubic meters of rubble and sediment in the cave entrance and in the cave itself. Two artificial walls were installed; one at the cave entrance, so sediment wouldnt slide from the crater into the cave, and the second was installed just beyond the entrance corridor inside the cave. The opening helps to measure the water flow per second. 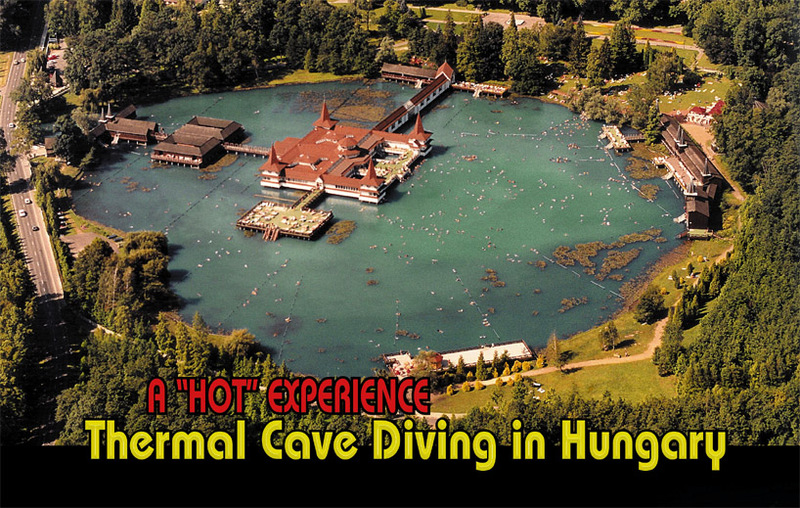 Currently, the cave spits out 420 liters/second of 38.1 degree Celsius (100 degree Fahrenheit) thermal spring water. There were also temperature-measuring devices installed in the cave along with two sets of large pipes that bring hot water into the bath house for the spa guests. During those years, about 3,000 cubic meters of sediment was removed from the lake. During the four years of construction, there were only two incidents of Type 1 DCS (skin bends). When we arrived, George Kovacs, who is the head of dive operations in Heviz, greeted our group. George is one of a handful of commercial divers in Hungary. He is a Padi and CMAS instructor and also an IANTD trimix instructor. He currently also serves as the president of the Hungarian Cave Rescue Association. George started diving in 1962 and became a commercial diver in 1966. He has logged over 28,865 hours underwater. George also has two guides who help him with dive operations, Bea Borocz and Sandor Irsai. After an extensive dive briefing, we loaded up our gear and headed over to the spa area of the lake. We were assigned a few cabins where we could change, gear up for the dive, and leave our gear. Last year, I dove open circuit with twin 10-liter tanks. This year, I brought my Draeger Ray SCR. Since I use an Uwatec Air Z O2 dive computer in conjunction with the OXY II (outfitted with adapters for the Ray rebreather), I chose to use a 35% O2 mix with my 40% O2 orifice. This gave me about 28% O2 in the loop. I used an 8-liter steel tank, and I also brought along a 4-liter bail out tank with air. After gearing up, Joerg, Nic and myself made our way through the pool area to the front platform where we entered the water. We waited for George, he was our guide on this dive, but he was on his last deco stop with his first group. 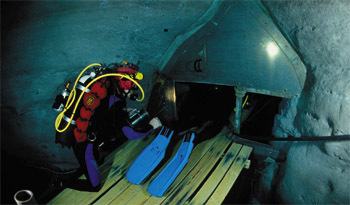 About 20 minutes after George surfaced and after a thorough gear check and cave entering procedure, we begin our dive. First, we descended to about 3 meters, swam over to two large pipes, these pipes supply the hot water to the indoor area of the spa, and then headed down the silty slope to 9 meters. At 9 meters, the wall starts. At 25 to 30 meters, I turned on my dive light to illuminate the green water. I felt the warm water rising from beneath us and at about 35 meters, the wall along with the pipes sloped inwards. At 38 meters, everything silted out. I kept moving along the rope until the water turned crystal clear and very warm. I had reached the entrance. The opening was 90 cm wide and 60 cm high. The crystal clear water coming out of the cave was a balmy 38 degrees Celsius (100 degrees Fahrenheit). The water rushes out of the cave through the opening at about 420 liters per second (roughly 111 gallons per second), creating a washing machine effect with the silt in front of the entrance. George, then Joerg and Nic entered the cave. I followed in the rear. I checked my O2 and PPO2 level and took off my bail out tank. I completely vented my BC and made my way into the opening. I got through the first opening fine and pulled myself along the wooden planks. I continued my way towards the second opening. The water was still rushing at high speed against me. I was almost afraid to look down because I wasnt sure if doing so would knock off my mask. I pushed my bail out tank through the second opening, where it almost slid into the silt. I tried to get through the second opening, but was stuck. On the second try, I made it through, and entered the cave. The fast current was now gone, the water was warm, and the visibility was amazing. The cave is spherical, 17 meters from top to bottom and 16 meters in diameter. Our bottom time was planned for 20 minutes. We started our exploration tour of the cave. Along the right side, we saw several other cracks in the wall where hot water poured out. On the right side, there were 10 cracks where water of various temperatures came through. The warmest water was 41.6 degrees Celsius. The left side was the cooler side where the water was about 24.6 degrees Celsius. Mixed together, the water temperature was 38.1 degrees Celsius. After checking the openings and other cracks in the ground and taking pictures, George reached into the wall with his fingers. It looked like he was digging something out. Before long, he pulled out pyrite gems and handed one to each of us as a souvenir. We then ascended to the top of the cave to a gas pocket where you can surface but should not breathe the air. Our depth was 34 meters. After 20 minutes, it was time to exit the cave and start our ascent. One after the other, we laid down on the platform, venting all of the air from our BCs and inching our way forward through the cave opening. The current quickly picked you up and flushed you through the cave opening and into the lake. 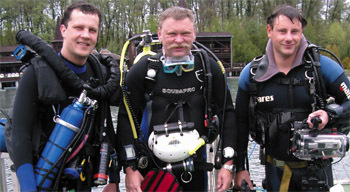 George Kovacs and his crew offer diving in Heviz between the months of October and April every year. Nitrox is available and trimix is also available upon prior request. Languages spoken are Hungarian, German, and English. Peter Schneider is a Swiss native living and working in Chicago as a cameraman. Whether it is the Great Lakes, icy mountain lakes of Switzerland, the Mediterranean, or Malpelo and Cocos in the Pacific, he loves to travel and dive. His special love for Hungary is because he is of Hungarian descent.